During this last segment before the summer break, the folks from the Adult Confirmation Class have been helping out. I got to teach the lesson last night. I showed them one of the famous pictures of Jesus knocking at a door and asked them what was missing. With a little coaxing, they recognized there was no doorknob on this door. “How is he going to get in?” I asked. We started talking about where the doorknob is on the picture. There must be a doorknob on the inside of the home. We have to open the door from the inside. In John 5:1-9, we find a story of a man who has been an invalid for 38 years. He is a Jewish man sitting next to a pagan pool–that’s how desperate he is. It is a pagan pool close to the Sheep Gate of Jerusalem, but also close to the Roman Fortress of Antonio. He is waiting for the pagan priests of Asclepius, the god of medicine, to release the water from the upper pool to stir up the water in the lower pool. 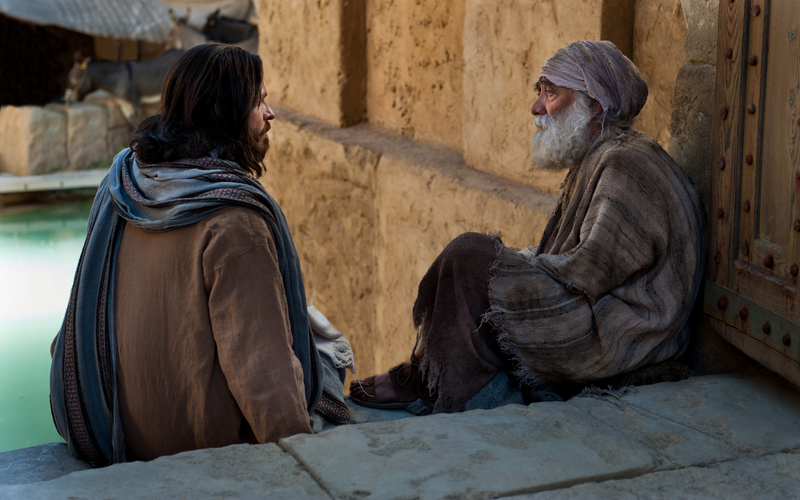 Jesus approaches this crippled man and asks if he wants to get well. The man gives an answer equivalent to, “Is a frog’s bottom waterproof?” The crippled man wouldn’t be at the pool if he didn’t want to be well. We find from the passage that no one is present with the man to put him in the water when it stirs. He can’t get there acting alone before the healing water dies down. I find two things amazing about Jesus in this story. The first is that Jesus asked for consent. The second is how little Jesus required of the man. As I told the kids in my story about Jesus knocking at the door of our hearts, Jesus won’t come in uninvited. As evident in Jesus’ healing stories, he will not heal uninvited either. Why is this? Couldn’t God snap fingers and everything would be healed? Evidently not. Evidently God cannot simply snap divine fingers and heal all things unilaterally. After all, we believe a loving God wants to heal all things, and yet all things are not healed. Apparently, God cannot heal without consent, because love never forces its will on another. It scares some people to think there are things God cannot do. But the Bible tells us that God cannot lie. God also cannot show favoritism. God cannot do anything unloving, because love defines God’s character. Thomas Jay Oord puts it this way: God can no more do anything unloving than a mermaid can run a marathon. Think about that a second. What is required if we want to be made well? Our cooperation. If we want to get well we must be willing to invest. What do you need to invest? Maybe your investing means spending time with those who can help you experience something new. Maybe it means going ahead with that radiation therapy–an instrument of God’s healing. Maybe it means beginning to take a medication every day. Maybe it means joining a support group or getting some counseling. Maybe it means cutting up those credit cards. Maybe it means calling a friend. Maybe it means eating those five green vegetables a day and getting some exercise. Maybe it means reading a book or taking a class. All of these can be instruments of God’s healing if we are willing and ready to cooperate. God desires and is always working for our well-being. But God will not override our will. Love cannot override our will. We must cooperate if we want to avail ourselves to all God wants to give us. We find sunergo in 1 Corinthians 16:16 and 2 Corinthians 6:1. In these instances and others, we are also called to cooperate with those who are cooperating with God. We also cooperate with God when we receive God’s grace and extend it to others. In fact, we are God’s preferred method of delivering his grace. John Townsend, in the book Loving People: How to Love and Be Loved describes one man who had never learned to be emotionally present with his wife. He had never experienced emotional support from his parents or anyone else. Townsend, a counselor, sent him to a men’s group where he received what God had to give him. God used the men from the retreat to bring healing. In turn, the man was able to give his wife what he had received. “Do you want to get well?” asks Jesus. By asking this question, Jesus puts the ball in our court. The crippled man was not the epitome of faith. At the time it did not matter to the man where he received his healing, but he was willing to pick up his mat and walk without questioning, even after 38 years of being immobile. God can work wonders with little. We need not worry about being “good enough” for God. Our performance isn’t the primary issue, but we must cooperate. We must open the door from our side and respond to God’s call. Are you willing to take a risk? This is great stuff, Donna. I love the participatory mode of the story. And you bring in some natural illustrations to support your use of the story.